In 2014, one of the biggest projects I worked on was for the Natural History Museum of Los Angeles County. When I say 'biggest', I mean that in every sense of the word. The project for NHM was to create illustrations which would serve as the outer wrappers for their Earthmobile and Seamobile: two full sized semi-trucks with converted cabs that functioned as mobile museums. These trucks make scheduled stops at schools in the LA area and show all the wonderfully diverse wildlife found in California. I worked with the wonderful folks at KBDA and NHM, and my amazing agent, Deborah Wolfe. The turnaround time was very tight, but with a lot of coordination and effort by all, we were able to produce one of the most memorable projects I've had the good pleasure to work on so far. Once I received the brief, I produced a series of sketches based on the requirements. The brief was quite thorough, complete with reference materials and all the information I needed to jump onto sketches as quickly as possible. I produced a set of thumbnail sketches on paper to explore composition and layout. When I had my pencil sketches worked out sufficiently, I moved to the computer using Adobe Photoshop to digitally sketch my first pass at the comps. Working digitally goes much quicker for me when I've done prep-work with sketches on paper. Sketching on paper helps to focus my attention on the big picture without getting too wrapped up in the details. This also frees me up once I begin sketching digitally so I can move quickly. Here are the digital comps I presented. To color this piece, I ended up skipping one of my traditional steps (working in black and white) and instead decided to work in color. I did this because I already knew where the final color version would be headed and working in sea greens and blues helped me work in the mood of the overall piece. Its fun to change things up once in a while, and when my direction is clear, I head for the finish. The challenge with underwater scenes is lighting it in such a way where it feels accurate without actually being accurate. 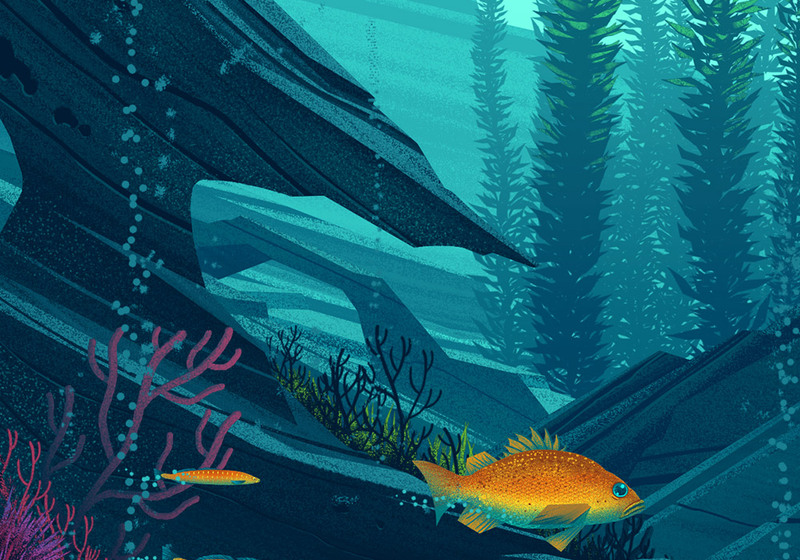 We didn't want the underwater scene to feel dark or ominous so it was important that my values achieve contrast without skewing the mood of the illustration away from inviting. I developed 2 options, one pushing the blues of the water, the other pushing greens. After some discussion, the blue came out to be the winner. There was also quite a bit of discussion around the type of underwater vegetation so instead of the eel grass pictured above, we changed it to coral as you see in the final. Here are a few shots to show just how detailed this piece is - but if you're in California and have the opportunity to see the trucks in person, be sure to check them out! The second illustration I produced was for the Earthmobile, which focused on the wildlife found within the California foothills and trails. We followed a similar process for this illustration since we were pressed for time and because it worked well for the Seamobile. After I had worked out the overall composition on paper, I moved to Photoshop to produce the sketches I would send the client. This was such a fun project to work on and I can't wait to get to LA at some point to see the trucks in person (the photos I've seen are pretty amazing). Thanks to the fine folks at KBDA, NHM, and Deborah Wolfe for all the help and for a fantastic project!